Heather and Myles Geyman's ceramic phone dock blends modern style, handmade warmth, and everyday usefulness. The elegantly contemporary good looks of Heather and Myles Geyman's handmade ceramic phone dock almost makes you miss how practical it is. 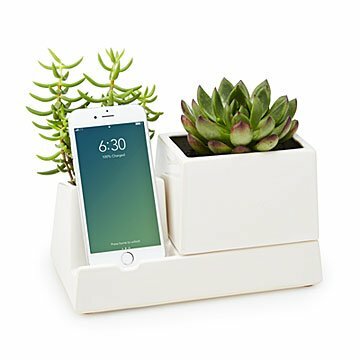 Besides holding your phone upright while it charges (the cord fits through an opening near the bottom), it provides a home for a medium-sized succulent plant, pens and pencils, keys, thumb drives, and other office odds and ends—even some cut flowers, if you like. It's designed to be modular, so you can put the vase elsewhere and use the base as a catch-all. A sister design to our popular Bedside Smartphone Vase, it's made of white ceramic, with a clear gloss glaze. Handmade in Pittsburgh, Pennsylvania. I like the flexibility that this piece provides. You can use soil-based plants (real or fake--it has a drainage hole and catch basin), flowers, desk supplies like pens, scissors, etc. It is also sturdy to hold my phone and charging wires. My only issue is that your charge wire hangs freely and can wiggle out, which a little tape will fix easily. The product was used as a corporate gift to one of our business partner's employees. We didn't want it to be too over the top yet have the style and quality that would support the way we felt in our gratitude. Its a nice way to add a touch of class in any setting where phone charging/displaying are wanted. Very well made, and holds a lot of dirt for flowers, or whatever you want to put in there. We use this to hold my husband's phone, wallet, and keys.